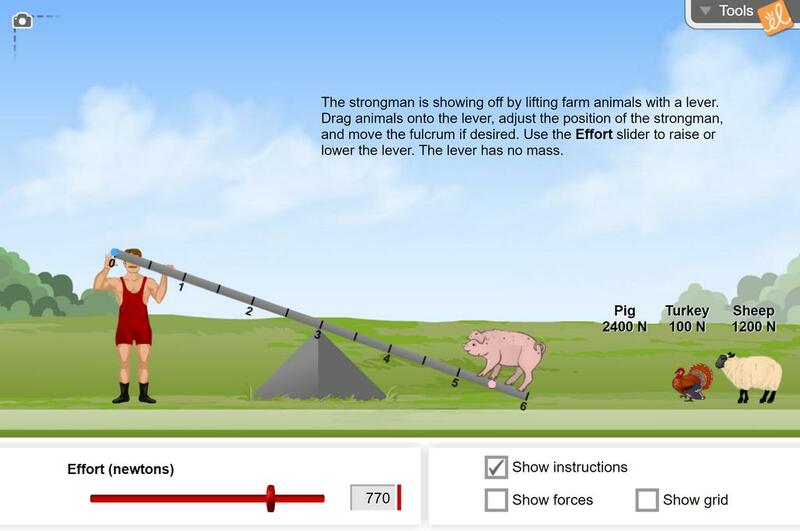 Use a lever to lift a pig, turkey, or sheep. A strongman provides up to 1000 newtons of effort. The fulcrum, strongman, and animals can be moved to any position to create first-, second-, or third-class levers. Identify the parts of a lever. Discover that a lever can be used to lift heavy objects using less force. Describe the relationship between the applied force (effort) needed to lift a load and the distance from the fulcrum to the applied force. Diagram a first, second, and third-class lever. A translation of the SE sheet. Notes illustrating the lever, fulcrum, load, and effort. The notes also illustrate the 3 classes of leve... (more)rs and how to calculate the mechanical advantage. You should do this Gizmo. This one is funny! A-W-E-S-O-M-E! Students who did not understand these concepts before are having "Aha!" moments! KUDOS!